In the String Ribbon technique, high temperature strings are pulled vertically through a shallow silicon melt, and the molten silicon spans and freezes between the strings (diagram left). The process is continuous: long strings are unwound from spools; the melt is replenished; and the silicon ribbon is cut to length for further processing, without interrupting growth. This advantage in material efficiency means String Ribbon yields over twice as many solar cells per pound of silicon as conventional methods. Additionally, the resulting distinctive shape of the solar cell allows for a high packing density. Productivity has been continually increased by increasing the width of the strings, the thickness of the strings, the speed of pulling the strings and the number of strings pulled from a single furnace (now four strings using its Quad furnace technology). Not to be misleading, thin-film silicon producers use less silicon than Evergreen, Evergreen uses less silicon than conventional multisilcon and crystalline solar cell producers that account for more than 90% of solar cell sales. 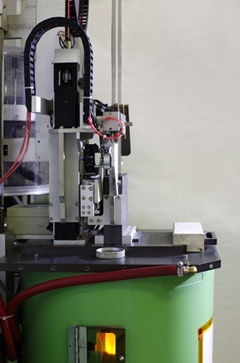 Evergreen's cells are ~100 micrometer thick compared to 150 micrometer or greater thickness of other producers. Thin-film cells are usually less efficient than conventional cells, which may be important if space requirements are critical, the high efficiency cells requiring less space. Its technology should give them a cost advantage in the conventional silicon cell market. The conviction of the company is proven by the building of this plant. All the councils in order to save energy at home! Remember that a PV plant in essence builds powerplants. So 300 MW of capacity means it can add 300 MW of capacity a year. That said, I agree, more capacity would be nice, but the economics (i.e. demand @ current prices) are not there quite yet. This is just one manufacturer, and ramp up of production is a tricky thing to do. You have to maintain quality, and you have to ensure that the costs of expansion are under control so that pricing remains the same or less. You have to hire and train new employees - both for production, and also for sales. I agree with you on the PV plants producing PV powerplants, but disagree on what you said about the economics of PV. You could have said that PV economics, as defined by $/Wp, or $/kWh, are not there yet. I would have said you're right, but they are headed there. You could have said that PV economics are still subsidized. Several governments are subsidising solar power. I think this is particularly true for Germany and Spain. I would again have had to agree, but would have pointed out that all energy sources in the USA are subsidised. What you said was: PV "economics (i.e. demand @ current prices) are not there quite yet". This I have to disagree with. PV demand has been out pacing supply for a few years now. This is why raw silicon, PV cell, and even PV module prices are so far above the price of production. Look at the number to the left at www.solarbuzz.com The average price for 125 Wp and larger PV modules is $4.84/Wp, but the low end price for mono-crystalline Si, poly-crystalline Si, and Thin Film PV modules are $4.30, $4.11, and $3.49 respectively. If the market were over-supplied then you would not see such a wide distribution in pricing. Another indicator of over demand is that many companies have multi-year supply contracts for raw Si, PV cells, and even for PV modules. In a high demand market you need to lock down your sources. the industry is doubling about every two years. Sustain that pace for a decade and thats a 32times increase. So at current growth rates we are at least a decade away from PV being able to make a significant dent in new power demand. What is really needed, is a real breakthrough in thin-film, or concentrating Photvoltaics, or thin film applied to construction materials. These areas all have companies whose business plans claim to be shooting for $1/peak watt within a few years. Hopefully at least some of them will be successful. The price performance of the sort of panel that evergreen uses has only been improving by 5-10% per year. More promising technologies are needed if PV is to become an important energy source earlier than 2025. For residential and small scale commercial sites, most of the cost of grid power is in the power distribution system, so even at current prices it is cost effective power for some customers. As prices are driven lower, the number of sites which could cost effectively use PV will increase dramatically. This cost does not go away when solar panels are put on houses because PV does not reduce peak demand and only provides electricity for a small portion of the day. The real problem with small PV (and thermal solar too) is that it is too expensive to repair. I have actually had people brag about their solar panels only to find out they do not work. The good thing about the huge German subsidy for production is that there is an incentive to keep panels working. When you integrate the exponential increase for growth do not forget to subtract the exponential decrease from die off. You will never see a press release stating that the solar panels stopped working and they never made enough electricity to pay for fixing them. They have the same goal as Sunpower and several other companies. Half the world's markets is huge. Based on the number of different technologies, and different approaches within these, I don't see how we could miss. If they're so unreliable then how is it that numerous PV panels come with 10, 20, or even 25 year warrantys? "This cost does not go away when solar panels are put on houses because PV does not reduce peak demand and only provides electricity for a small portion of the day." Funny, maybe I'm mistaken, but I'm pretty sure I've seen graphs that show that peak demand for electrical power and peak output for solar power match up during a good portion of the day. Specifically, when it's hot and sunny, folks run their air-conditioning the most and the sun is also shining the brightest. So color me surprised to learn that solar doesn't reduce peak demand at all. I certainly hope that PV will have it's place in meeting electrical demand, but I'm also hopeful for concentrating solar. I'm pretty sure I've heard of several concentrating solar projects that include thermal storage so that the solar power station can produce power for large portions of the day. I might have sounded a bit negative on Evergreen. Actually the manufacturing technology described here sounds pretty cutting edge. I hope that it will result in substantially lower cost modules. I don't expect the cost savings to be passed onto consumers because the demand is too robust. Kitp: if the panel lifetime is fixed, and we have an exponential buildout, we would still have an exponential increase in working capacity. That can be shown by differential equations 101. But mds is correct that these products have long warranties. It may be that you knew people who bought first generation solar water heating systems? As long as the peak demand is during the sunny time of day, PV would reduce peak demand -as seen by the power company. Of course power line upgrades only come in very large discrete increments. In actuality having the power company reimburse (or credit) homeowners at anything near residential rates does represent a substantial subsidy by the utility. At current solar capacities this isn't big enough to be a problem, but clearly several years from now if exponential growth in solar continues, public service commisions will have to negotiate a deal which is more favorable to the utilities. Presumably existing PV owners can be grandfathered into their current contracts. SG, I agree that solar PV should be part of the energy mix. Please notice I was referring to small systems on the roofs of houses. I was also surprised that solar PV did not match summer peak in the southwestern US. It took careful reading to get past misleading information. The issue is selling solar panels to well meaning people who will not maintain them. I sure that mds has never actually read the warranties or would take out a 30 year mortgage on something with a 25 year mortgage. mds may not know that the inverter (aka smoke emitting diodes) only has a 5 year warranty and cost $5k just the parts. mds may not have factored in the cost of annual inspection to reduce the risk of linemen working on down. What this all means bigTom, is that the factor in front of exponential growth is very small and the factor in front of the dieoff is (-)o.99. kitp: The growth factor (unit 1/years) would be approx .4, the dieoff is probably .02 to .03. I loved the "smoke emitting diodes" remark! The lineman issue is of course often overlooked. The utility has a very legitimate reason for wanting to insure that your system won't energize the line during a power outage, and injure their personell. Some people take umbrage at the requirement, but it is there for a very good reason. 165M for 70MW, that is $2.357/W, isn't it? But the solar cell price is @3.7/W. Who can tell me the facts? Chan6372, that cost figure is just the capital cost for the manufacturing plant itself. This will be amortized over the total Wp of cells (or panels) this plant will deliver. You also have to know all variable costs (silicon, labor etc) and of course the company margin. Well the company margin depends upon the market. If there was little demand they might have to sell product for below cost. But with the expected high demand they may be able to make a handsome profit. Someday when production catches up with demand there will be a shakeout of the less efficient producers. bigTom, your numbers look reasonable if the system is maintained by a utility committed to making electricity with PV. You might be surprised by the number of pictures of PV systems used in PR that do not produce electricity. One of California's self proclaimed 'leading solar' unities and the US EPA are among the publishers of of these pictures. To be fair, the EPA did discuss in their presentation that explained some of the pitfalls of renewable energy economics. The real problem with small PV (and thermal solar too) is that it is too expensive to repair. Where do you get thet thermal solar is expensive to repair? Repair what. Change a $20 sensor every 2 years?? (maybe?) I don't know of any other heating technology that requires less maintenance, provides huge amounts in savings (to it's owner). As to die off, if you get a good solar heater it can last easily 30 years or more. PV is still a different story, until prices go down, and I hope they do. Well Greg, I would be happy to review your data on cost or performance. In 1986 when I designed and built my system, I was not able to find any working systems. Lot of ugly crap installed on roofs, no working systems. Great article. I just had a big company that installs solar panels in homes contact me. The want to use an ultracapacitor to store the energy that is created by the solar panels. Total cost about £190, mainly comprised of two minimum call-out labour charges as they didn't have any replacement gauges the first time they turned up. This compares to about £70 for an annual (oil: that means kerosine here) boiler service check. No replacement parts other than burner jets. The solar system supplies about 50% of my annual hot water needs. Probably not cost effective compared with oil at present cost (~34p/l) but I was using LPG when I had it installed & that is MUCH more expensive. So not particularly expensive to maintain, but not negligible either. At first thought ultracapacitors + PV don't seem to solve anything. Clearly the UC cannot economically store enough energy to bridge the day/night supply problem. They might be useful for smoothing out very short duration spikes however. For grid based applications could they play a part in making the invertor cheaper, and/or more reliable? This is great news for the environment and for jobs. Ethanol factories and solar factories seem to be on the upswing. Glad to see solar being made in the USA. I guess we have Greg and greg. I'm greg. Popular name, almost as popular as solar is getting. Kit, I don't know where you are looking for your solar heaters, but maybe you haven't looked around too much. Or you live too far north and solar is still not catching on there. As to all the maintenance described by Max, I don't know how your installation is, but you might ask if your pressure vessel can be installed in a location with a lower temperature. (Longer connector tube with down U curve might help keep it cooler). It's not rocket science but some installers miss little details. This is the most maintenance you can expect in solar. To me the best way to go is passive thermosiphon if you can. No pumps, no controls, no special valves. No moving parts to wear. Kit, you may have experienced something similar to what happened around that time in California. Well intentioned (we hope) lawmakers started giving tax incentives to anybody who had anything that looked like a solar heater on their roof. The incentive was so good that everybody jumped on the bandwagon and you even had cases of people putting pseudo solar collectors on their roof and not even hooking them up! Of course the incentive failed and solar got a bad name. Fortunately that didn't last. As to the numbers, solar heaters actually pay for themselves with the energy they provide. Depending on your climate conditions, type of system and energy source it's replacing, it can be between 3 and 6 years. There are also some people who are simply clueless. I remember hearing of an incredible screwup involving the early days of solar water heaters. State incentives caused a new apartment building to add solar water heaters. After the apartments opened it was realized the heaters provided no hot water. The contractor was baffled, as he followed the directions included with the water heaters to the letter. It turns out the water heaters were imported from Australia, and the instructions said to install them facing North! Max, thanks for the good info. Would you clarify if you use hot water for heating? greg (the lower case), checked component prices for the passive thermo-siphon system I designed and built that supplied 100% of a family of 4 (two teenagers) 360 days a year. Ignoring interest, the payback was 8-10 years. The system consisted of two collectors located below the house, storage tank, and mixing valves. The basic problem with economics is that the average family does not use enough hot water. A family of 8 would half the payback period. The second problem is bigTom's clueless factor. Where I lived in California, we got 60 more days of sun than just 500 feet lower in elevation. PV does not work very well either in the tulle fog. My favorite is the panels wired incorrectly. Thermal solar makes a great radiator at night. Solar heaters are usually dimentioned so they provide from 75 to 90% of the energy load (averaged through the year). The reason for this is that to get 100% it means certain times of the year you will be wasting energy on a system that is too big and too expensive. By sizing it correctly you will utilize a bigger percentage of the energy of a correctly sized system, and the back-up is small enough. For example if you wanted 100% done by solar alone, your equipment cost would have to be about 50% more (or more) to go through not so sunny days. 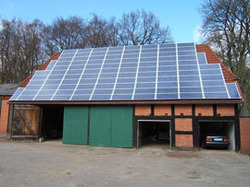 Bare plastic solar panels are excellent for discipating excess heat from swimming pools and could be used for certain air conditioning applications. I know US prices are higher than say Spain, Turkey, or Australia, but I still think you can get better prices for good quality systems. BigTom, I must disagree. Most of the cost of a solar system in California is the big SUV that is driven (sorry, pun was unintended) by the wife of the solar contractor. Also there is the BMW that is an absolute necessity for the teenage daughter of their attorney. So what is the problem with wasting solar energy? What is the added cost of two panels instead of one and a slightly larger storage tank for a passive thermo-siphon system installed on the ground and designed to be manually isolated for a few days when it might freeze? Amortized of the life of the project, the added cost is minimal. I think solar is a great technology. When the solar industry starts focusing on harvesting that energy rather than ripping off consumers. There are still bragging about putting solar panels in all the wrong places in California. It’s always interesting to see how these blog discussions unfold. This particular article was about Evergreen Solar, the company. Blog responders immediately lapsed into an entertaining give-and-take about the joys and horrors of PV technology. Evergreen, the company, quickly became irrelevant. In this case, that is probably a good thing. Evergreen is one of those companies that should not be public. It should be an R&D company funded by venture capitalists. For thirteen years, they have borrowed money, sold shares, and produced a product which was sold at a loss. The 2006 loss was reported to be in excess of 22 million dollars. Sorry, shareholders. Maybe later. By the time Evergreen figures out how to operate a company which returns a profit to its owners, its technology is likely to be obsoleted by the next big thing. PV may someday become a significant contributor to the great American energy scheme, but it seems unlikely that Evergreen will be around to enjoy the moment. Buy their panels? Sure, if they fill a need for you. But, buy their stock? Yikes! Danzig, the discussion could be more off base. No one has brought up solar algae yet. KitP - I'm in southern England at 51°N. It freezes often enough that drainback or warm-circulation systems lose too much potential heat in the winter. I use evacuated-tube collectors, so just increasing the panel area would cost a lot: I have 2 square metres collector area. The change in day length between winter & summer, as well as the change in air-mass, makes a 100% system impractical. greg - the collector is roof-mounted, the expansion vessel is in the roof space above the insulation. The problem seems to have begun with the air bleed valve, which was venting tiny amounts of water. Because the pressure gauge was 'slow & sticky' to respond to pressure changes, at some point the diaphragm in the expansion vessel ended hard against the top surface - i.e. there was no water in the vessel at all. Eventually, I noticed the problem & repressurized the system. However, the pressure could now act only on the part of the diaphragm right opposite the inlet port & this wasn't enough to unstick it, so disabling the expansion vessel. Issues of planning consent, available ground area, shading (remember the sun gets very low in the winter here! ), and security tend to make thermosyphon systems not such a good idea. Roof-mounted collectors are almost universal. Since I installed my system, there was a scheme that provided a 'cashback' type subsidy after installation. But it had to be an approved system, and installed by a approved supplier. It was about £400, but I think the money has run out now. Solar thermal is steadily getting more common. A final point to anyone looking at such a system. Because the temperature difference between the solar circuit & the DHW tank is quite low, performance can be heavily hit by scale build-up. If you are in a hard water area, you should consider fitting a softener. The system Max described would be 180 miles north of the US-Canadian border. My system would have been the solar equivalent of mountain in the south of Spain. When I built my solar system the big thing was not building any more nukes. AGW had not been invented yet. 1.Falling off the roof and dying. 3.Panels falling off the roof and killing someone. By installing my panels on a south facing hill, two potentially fatal hazard were precluded. My systems triple redundant mixing valves for the shower making that hazard about the same as the thermostat failing on a electric hot water heater. So greg, how much money is the life of you daughter worth? I betting that greg would go up on the roof just for the fun of it. However, when I am doing risk analysis I always ask the macho guy if he would want his baby daughter to grow up and take the same risk. My solar system was a learning experience. What I learned was that I could not ethically make a living selling solar systems. I concluded that those who promote putting either PV or thermal panels on the roof of house to meet the energy needs are either fools or thieves. Twenty years later I have yet to meet anyone who does dot fulfilled those qualities. Gathering and producing energy is dangerous. The fool who placed the panels facing north could have just as easily installed the relief valve in the wrong location or set the mixing valves incorrectly. Energy systems need to be installed correctly, tested, and maintained to produce energy without killing people. It sounds to me like Max has made an informed decision to buy and maintain a solar system by professional who hopefully take the proper safety precaution. Reading between the lines, Max has been carefully to not make exaggerated claims and explain the pitfalls. So now I have a working solar systems that is more than five years old. This shows it can be done. Either a qualified, licensed installer must perform the work, or you have to pay the local authority building Inspector to come & check & approve the work before it can be put into use. DIY is becoming unfeasible. Max I believe certain safety standards are necesary for anything, especialy if it involves construction safety and water quality. I just hope the laws in the UK aren't keeping people (or making it very difficult)to be free to DIY. Sometimes you wonder if certain laws arent designed to protect certain trade groups or other interests! Whoever thinks thermal solar is not an adequate technology to drastically reduce electricity, gas or coal consumption is totally ignorant of the facts. I have solar 100% DIY, would never dream of doing it with electricity. Once you go solar,(properly)why go back??? I save 4.5 KWH per square meter a day. PV solar becomes somewhat more feasible in regions which offer the opportunity of pumped storage, which seems to be currently at least 70% efficient. Massachusetts is also the state where a new product was introduced which reduces green house emissions as well as polutants on your vehicle while improving fuel economy by 10 to 30% depending on the vehicle. go to www.bladeyourride.com for information on the testing results as well as how it works. the testing was done at a CARB certified Lab in California using EPA-511 protocol. all results as well as the lab information is on the site. Thanking you for your quick response..
Great news from environmetal point of view. Just a question. What's the best manufacturers for solar technology? Or at least some lists of good ones. Thanks! I think that one real problem with small PV is its extensive cost for repair . There are many people who brag about their solar panels only to find out they do not work. This is great article! This just shows how vast solar panels have become. Solar panel systems continue to pave way for a brighter and greener future in home, buildings and industries. Apart from that, This system is excellent in providing cost efficient energy without harming the environment. The Sun is an abundant source of energy. Today with the help of cutting edge photo-volatic technology it is possible to harness more of this energy than ever before.This is made possible by Solar panels that convert the sun’s energy into electricity.With the growing enquiries for solar panels in sussex, Caregreen Sussex has been established to cover the Sussex and surrounding Areas.